We know how a quality outdoor lawn sprinkler system can be an asset to a lawn and yard but can outdoor water sprinkler systems also help fight air pollution? A scientist in China says yes. He says spraying water into the air from sprinklers on tall buildings and towers could potentially cut air pollution in several Chinese cities. Shaocia Yu has written about his proposal in the Springer journal Environmental Chemistry Letters. He says spraying water into the atmosphere would stimulate natural precipitation. This type of precipitation would be able to collect and remove aerosol and gaseous pollutants from the air. Using water sprinkler systems for such a use is far different than the plans most of us have for our lawn sprinkler systems, but it’s really similar technology on a much grander scale. Many cities in China are dealing with a heavy, constant haze and severe pollution. It’s the result of economic and industrial growth spread out over several decades. Yu says his idea could efficiently reduce the fine particle concentration in the atmosphere. He also says the water could be collected and reused. This means the plan would not make existing water shortages worse. Yu also says the plan reduces air pollution while remaining environmentally safe with no significant side effects. The plan would deployed on a massive scale within several communities at a low cost. Yu probably had lawn sprinkler systems in mind when he came up with the design. He says if people can spend half an hour watering their lawns, then half an hour can be spent watering the ambient atmosphere to keep the air clean. 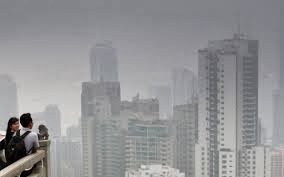 Air pollution is often difficult to manage and contain because the pollution often comes from a variety of sources such as coal-based energy, heating and traffic sources. The idea of using water sprinklers to clean the air like we use them to keep our lawns healthy is intriguing. If it can be done, perhaps it’s a way that water sprinklers can help make the whole planet a little greener.